While sailing to Europe as a result of winning the Chaloner Prize, REW met two circus acrobats. The result was an ad hoc performance for fellow passengers. REW is seen on the left. REW with his new Mercier bicycle. 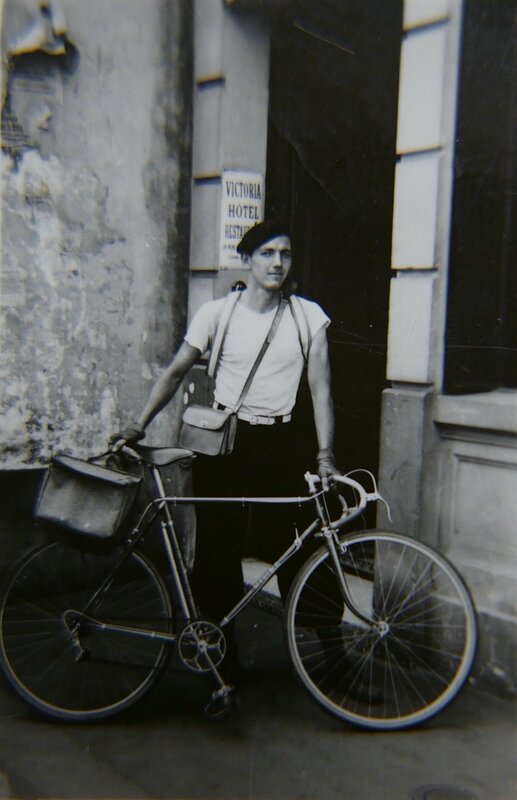 He and fellow Herron student Harry A. Davis cycled much of northern France the summer of 1939. The bicycle is still extant. REW on the Pont de la Tournelle with Notre Dame in the background. REW lived at the Hotel Liberia, 9 Rue de la Grande -Chaumiere, Paris. REW during a lifeboat drill aboard ship on his return home to the U.S. after urging by the American embassy to leave. He would arrive back in New York on October 2, 1939. Eternally sketching, even during his escape from Europe. This was probably taken in September 1939. 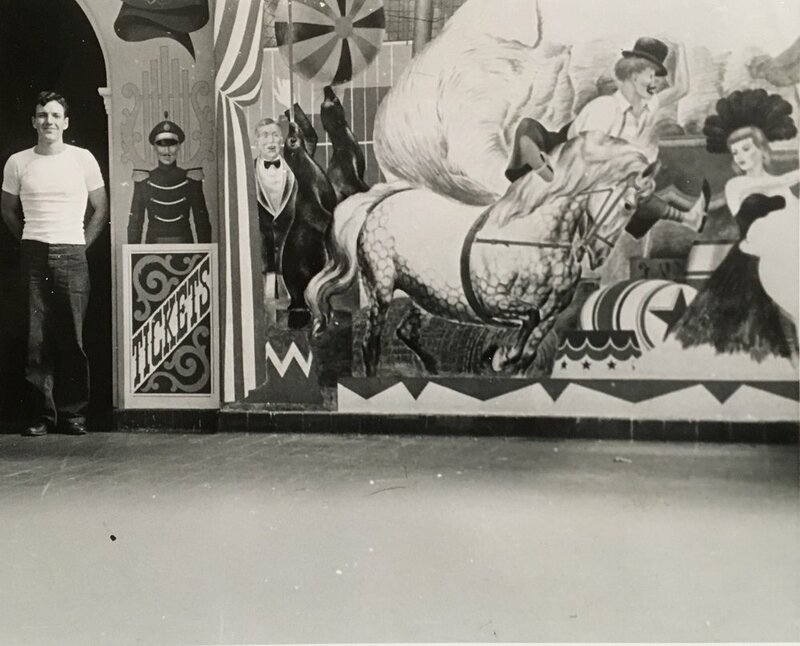 LTjg REW would paint several murals for the Bachelor Officers Mess at the Alameda Naval Air Station before he shipped-out to the South Pacific and duty with Rescue Squadron VH-3. Weaver sketching on Saipan, WWII. This image of REW was taken somewhere in the Okinawa theater of operations during WWII. Robert Edward Weaver was stationed with Rescue Squadron VH-3 near Kerama Retto. REW drawing for children on Kerama Retto. 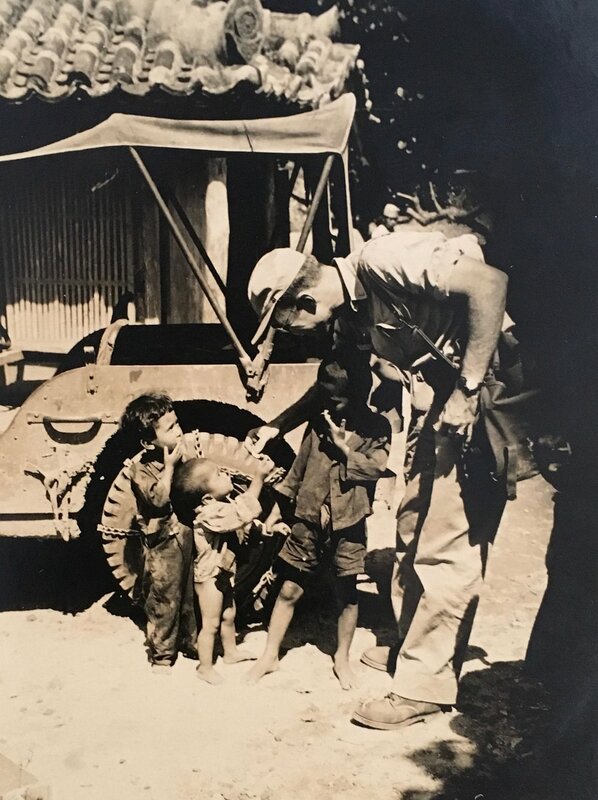 REW sharing rations with children at the end of WWII on Okinawa. In 1946 REW was commissioned to create a mural for the entrance to the Indianapolis Methodist Hospital's Children's Ward. Here the artist poses next to his work as he was creating it. REW is seen here in his studio located on Main Street in Peru, IN. He is with his prize winning work "The Butchering" which was shown at the National Academy of Design in New York City, NY in 1949. REW in his studio at the home he built for his mother in Peru, Indiana. This is a posed image of REW with his work "Brass Band." Registration card for REW to the Skowhegan School of Painting and Sculpture, Skowhegan, Maine. 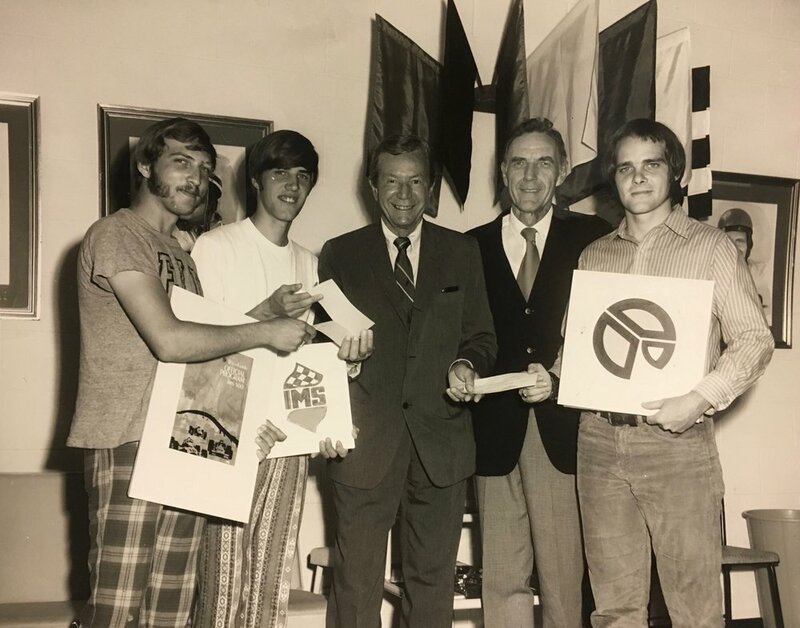 Each year REW would take his art students to the Indianapolis Motor Speedway (IMS) to sketch and experience the state’s greatest sporting event. REW was a long time friend of speedway president Tony Hulman, and many of REW’s racing artworks are on the campus of the IMS. 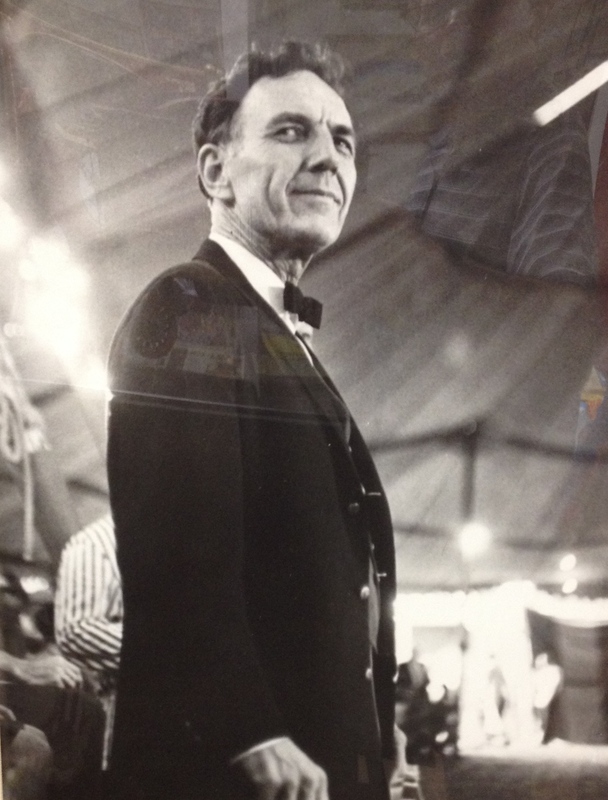 REW for the first several years of the Circus City Festival Incorporated acted as one of the circus's ringmasters. This image is from the early years of the festival which were under a tent prior to the construction of the CCFI's permanent location. REW was a long time friend of Indianapolis Motor Speedway president Tony Hulman. Their friendship resulted in the Hulman Prize for Design during 500 race week in Indianapolis. The competition was open to students at the John Herron Art Institute. From left to right: Larry Profancik, Warren Low, Mr. Hulman, REW, and Mark Miller.